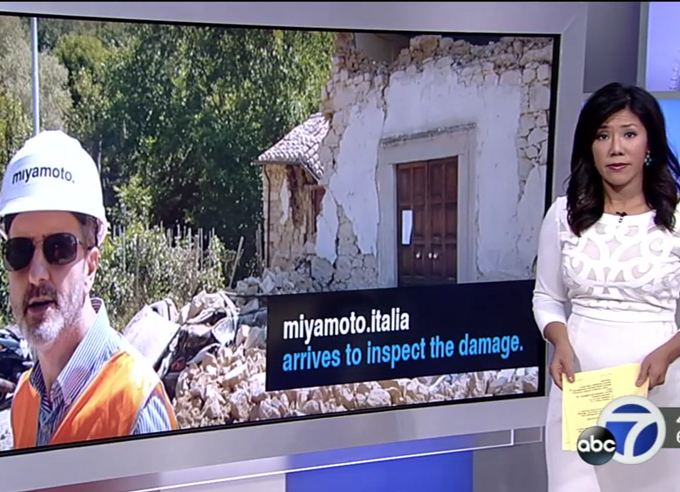 AMATRICE, Italy — An Italian bishop has issued a sharp critique of the suspected shoddy construction behind the high death toll in central Italy’s earthquake and warns that the rebuilding effort must not become a “form of looting” of state coffers. Pompilli read aloud the names of all 242 people killed in the two towns at the start of the service, which was held near Amatrice’s ruined buildings. The names ignited wails of grief from the victims’ families. This was the second state funeral for victims of Italy’s Aug. 24 earthquake. Another 50 people were killed in the neighboring Le Marche region, which had a state funeral Saturday. A Sacramento company is working there as well. Miyamoto International says its engineers are trying to learn why so many buildings collapsed so they can prevent future collapses. “Most of the buildings are unreinforced masonry. Mostly stone with mud and mortar,” explained Devis Sonda. Sonda says reinforcement is key. That is why even though brick buildings crumbled in Napa during the 2014 quake. Damage was limited because many had been strengthened. But Sonda warns thousands of buildings in California are not retrofitted and dangerous in the event of a big quake. Romania’s prime minister has proposed that the country holds a day of mourning for the 11 Romanians who died in the earthquake in Italy as he visited the area to comfort the families of the victims. Premier Dacian Ciolos toured the quake-devastated area on Tuesday and later attended a state funeral for dozens of victims of the Aug. 24 temblor. Ciolos said he will formally propose at a Cabinet meeting that Romania holds a day of mourning on Thursday. He visited four Romanian women who are hospitalized with injuries they suffered in last week’s quake. He said that all Romanians have now been accounted for. Some 8,000 to 10,000 Romanians live in the area where the quake struck. Last year, some 1.3 million Romanians were living in Italy. Wails of grief are erupting from families as the funeral for dozens of victims of Italy’s earthquake gets under way in the shadow of the quake-destroyed buildings in Amatrice. The names of the victims were read out Tuesday at the start of the Italian state funeral in the town hardest hit by the earthquake. Premier Matteo Renzi and President Sergio Mattarella were on hand for the Mass being celebrated by local bishops. Facing the altar, relatives sat with the flower-draped coffins of their loved ones. Some of the tiny white ones were decorated with white balloons – evidence of the many children who died in the Aug. 24 temblor that killed 292 people in central Italy. Thirty-seven caskets will be on hand for the state funeral being celebrated in quake-struck Amatrice. Officials from Italy’s civil protection agency asked relatives of the 242 victims from Amatrice and nearby Accumoli if they wanted to participate in Tuesday’s state funeral. Many of the victims were tourists visiting the medieval hilltop town. They and others have been claimed by relatives and buried elsewhere or are awaiting private funeral services. The evening service will be held on the edge of Amatrice in a covered area constructed overnight after residents balked at having the funeral in an airport hangar in Rieti, 65 kilometers (40 miles) away. A total of 231 people died in Amatrice, 11 in nearby Accumoli in the Aug. 24 quake. Fifty others died in the neighboring Le Marche region. Romania’s prime minister is traveling to Italy for the state funeral for victims of the quake and to comfort the families of 11 Romanians who died in it. Premier Dacian Ciolos’s office said he and Labor Minister Dragos Pislaru would visit the quake-devastated area Tuesday where some 8,000 to 10,000 Romanians live. Italy is holding a state funeral late Tuesday for more than 200 of the 292 victims on the grounds of a Catholic retreat at the edge of Amatrice’s obliterated medieval center. Last year, an estimated 1.3 million Romanians were living in Italy. Many work in agriculture or as domestic helpers and caretakers for the elderly. Construction crews worked through the night to build a tent complex to host an Italian state funeral Tuesday in quake-devastated Amatrice after outraged residents rejected the government’s plan to hold the service in a distant airport hangar. The evening Mass for more than 200 of the 292 people killed in the Aug. 24 earthquake is the second state funeral for victims of the temblor that flattened three towns in central Italy. The first, held Saturday, honored victims from the Le Marche region. Tuesday’s funeral is for the victims of neighboring Lazio, including hard-hit Amatrice. The service will take place on the edge of Amatrice’s obliterated medieval center on the grounds of a Catholic retreat for the elderly. It comes as Italy is observing a second day of national mourning, with flags on public buildings flying at half-staff.